And March is here... which means that Spring is right round the corner. Since it's a transitioning period, I wanted pair this flirty and summery dress with a tough leather jacket- I feel like it balances the girly-ness of the dress. This time I'm partnering with Abercrombie to tell you a little bit about their Spring dresses. As everything in the store, the quality is outstanding....and I have to admit something: I love their junior sizing...it's perfect for us petite girls (we don't have to worry about tailoring the length of the skirt/dress) Check out all the variety of dresses of different prints, colors, and fabrics by clicking here. I have another confession...since we got engaged, I've been obviously looking at wedding dresses. This makes me look at white summer dresses with a whole different perspective. I love them but when I try them on I feel like like a crazy bride that's dying to get married haha. Maybe that's why adding the leather detail was crucial to me!! 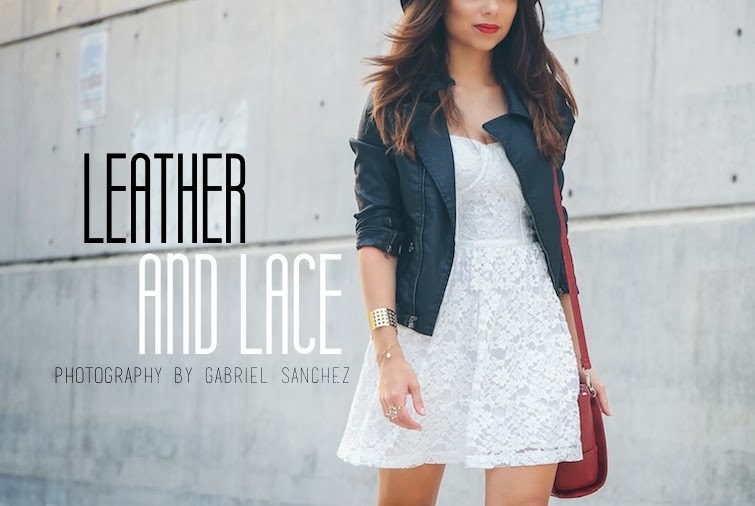 How would you wear this lace white dress? ¡Y ya estamos en marzo!!.. lo que significa que la primavera está a la vuelta de la esquina. Ya que estamos en una época de transición, quise combinar este vestido muy veraniego de encaje con una chaqueta de cuero para equilibrar lo femenino y romántico. En esta ocasión me uno a Abercrombie para contarles un poquito más de sus vestidos de primavera- como todo lo de A&F la calidad es excelente....pero hay algo que como chica petite me encanta: las tallas son juniors. Esto significa que todo lo que es falda/vestido me queda perfecto de largo; si eres petite, estoy segura que compartes mi "dolor". Las invito a que pasen a ver la gran variedad de vestidos con diferentes telas, colores, y estampados haciendo click acá. También les cuento que desde que me comprometí, he estado viendo los vestidos de novia obviamente. Pero me ha hecho ver a los vestidos blancos de diario de otra manera....me encantan y luego cuando me los pongo digo "Ya va todavía NO.. ¿no parezco una novia desesperada?". Tal vez por eso me pareció extremadamente importante agregar la chaqueta de cuero. ¿ Hay alguna otra novia que le haya pasado esto? ¿Cómo usarías tu este vestido blanco de encaje? Accessories: Svelte Metals, Katie Dean Jewelry, Tous and 2020ave. Thanks and keep post such a informative blogs. this look is perfection! I love everything from the boots to the hat to the red lip! Gorgeous gal!